The book to accompany the collection in English/German. Now available as a second, enlarged edition with over 1,400 flour sacks from more than 120 countries. A new home for over 3,600 flour sacks. And the Great Milling Family. At last – the world’s first and only FlourWorld Museum has opened its doors! Since June 2008 the world’s biggest flour sack collection has been accessible to the public, and numerous visitors have already explored the fascinating exhibition rooms – taken a journey through the World Room, discovered strange flour myths and passed through the inside of a flour sack. And the setting of the museum is impressive, too. As the former District Court of the town of Wittenburg the stately white building has an aura of calm and dignity. 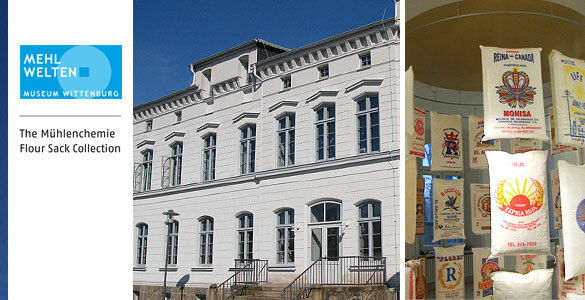 The unique atmosphere of the exhibition and its surroundings has an inspiring effect on the many encounters between Mühlenchemie’s staff, people from all over the world and the Great Milling Family. Welcome to the FlourWorld Museum Wittenburg! You will find more information about the museum at the museum’s own website at www.mehlwelten.de.